The Russian Orthodox Church (ROC; Russian: Ру́сская правосла́вная це́рковь, tr. Rússkaya Pravoslávnaya Tsérkov), alternatively legally known as the Moscow Patriarchate (Russian: Моско́вский Патриарха́т, tr. 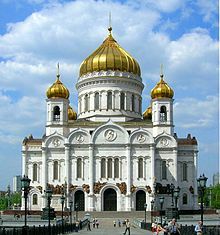 Moskóvskiy Patriarkhát), is one of the autocephalous Eastern Orthodox churches, in full communion with other Eastern Orthodox patriarchates. The Primate of the ROC is the Patriarch of Moscow and all Rus’. The ROC, as well as the primate thereof, officially ranks fifth in the Orthodox order of precedence, right under the four ancient Patriarchates of the Greek Orthodox Church, those of Constantinople, Alexandria, Antioch, and Jerusalem. The official Christianization of Kievan Rus’ widely seen as the birth of the ROC is believed to have occurred in 988 through the baptism of the Kievan prince Vladimir and his people by the clergy of the Ecumenical Patriarchate whose constituent part the ROC remained for the next six centuries, while the Kievan see remained in the jurisdiction of the Ecumenical Patriarchate until 1686. The ROC currently claims its exclusive jurisdiction over the Orthodox Christians, irrespective of their ethnic background, who reside in the former member republics of the USSR, excluding Georgia and Armenia, although this claim is disputed in such countries as Estonia and Moldova and consequently parallel canonical Orthodox jurisdictions exist in those: Estonian Apostolic Orthodox Church and Metropolis of Bessarabia, respectively. It also exercises ecclesiastical jurisdiction over the autonomous Church of Japan and the Orthodox Christians resident in the People’s Republic of China. The ROC branches in Belarus, Estonia, Latvia, Moldova and Ukraine since the 1990s enjoy various degrees of self-government, albeit short of the status of formal ecclesiastical autonomy. In Ukraine, ROC (represented by the Ukrainian Orthodox Church) has tensions with schismatic groups supported by the current government, while it enjoys the position of numerically dominant religious organisation. The ROC should not be confused with the Orthodox Church in America (OCA), another autocephalous Orthodox Church (since 1970, albeit not universally recognised in this status), that traces its existence in North America to the time of the Russian missionaries in Alaska (then part of the Russian Empire) in the late 18th century, and still largely adheres to the ROC liturgical tradition. The ROC should also not be confused with the Russian Orthodox Church Outside Russia (also known as the Russian Orthodox Church Abroad, or ROCOR), headquartered in New York, New York, U.S.A. The ROCOR was instituted in the 1920s by Russian communities outside then Communist Russia, which refused to recognize the authority of the Moscow Patriarchate then de facto headed by Metropolitan Sergius Stragorodsky. The two Churches reconciled on May 17, 2007; the ROCOR is now a self-governing part of the Russian Orthodox Church.